The phrase is found in a children’s book found by a mother who doesn’t know if she’s going insane. 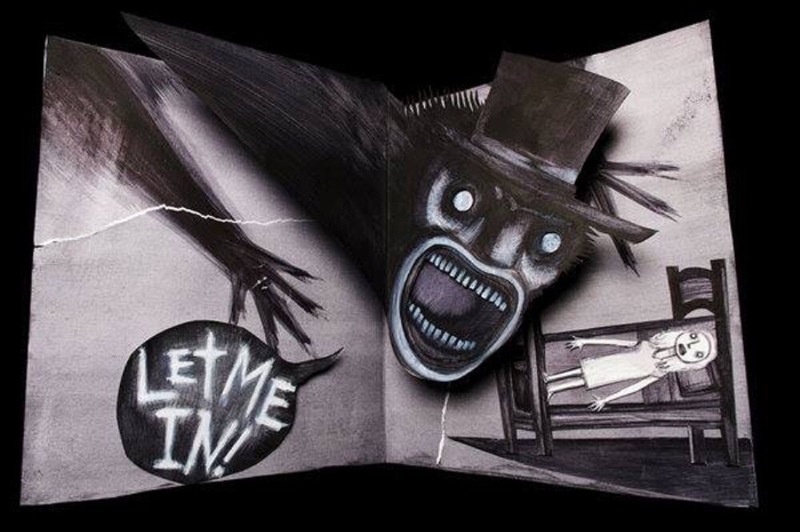 It’s the book titled The Babadook that spawns the horror of the movie, coincidentally producing a double meaning found within the pages of book, and overall story of the film. This whole runtime of the movie is a slow burn through some of the most intense and suspenseful sequences put to film, where all comes to a different ending than you’d expect. Written and directed by Jennifer Kent, it’s based upon an short film she made in 2005 entitled Monster; the idea is expanded upon here to far greater lengths. The film begins with the grief-stricken mother Amelia (Essie Davis) being plagued by the loss of her husband in an accident years ago through a nightmare, only to be woken by her son Samuel (Noah Wiseman) claiming that he had a dream about a monster who keeps visiting him. She believes Samuel is just wanting attention from his mom, but as she finds a book titled The Babadook and reads the pages inside, everything slowly sparks into a horrifying and maddening experience. The whole film plays tug of war with the question: is Samuel simply pretending to be scared of a imaginary monster as a ploy for his mother’s affection? Or should Amelia be just as scared as him of the Babadook? The real answer is surprisingly deeper than one would expect in a horror movie. It’s a little of both. After Amelia reads the book to Sam, strange things begin to happen in their lives. She tries to throw away the book and burn it, only to have it return taunting her telling her that the more she denies it, the stronger it will become. 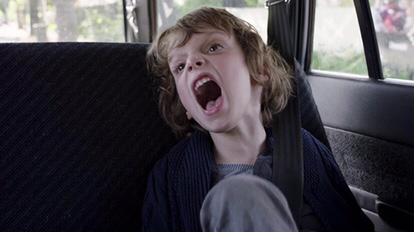 Sam is convinced the Babadook is after them, causing mayhem that starts to break Amelia down. His explanation? To kill the monster. Amelia sees her dead husband Oskar, telling her that if she wants to have him back, she needs to give her son to the Babadook. After refusing, she is chased and possessed by the monster. She then tries to kill Sam, only to regain her senses after he lovingly caresses her face. Now able to remove the monster from her body and confronts it, she acknowledges it’s existence, telling it that it will never hurt her family again. It recedes away and the family seems to be saved. The final moments are shown two months later and they’re happier than they were before, picking worms in the garden. Amelia then takes the worms to the basement and is attacked by the Babadook (which is seemingly living in the basement), only to calm it by placing a plate of worms down, and it taking the plate and sulking away. Grief? What if Amelia’s refusal to accept Oskar’s death was the root of all that happened? A few key things that gave this away. The film starts with her dreaming of the accident. Whenever anyone mentions Oskar, she silences and tells them to stop. She keeps the basement full of his things, from his clothing to all of his hobbies. Remember where the film ended? She lives in a state where she simply can’t accept what happened, and kept this all bottled in until she exploded. She doesn’t realize that grief is a part of all of our lives, that it has a place in our hearts, along with love, fear, joy, all those things. The film tells us that we must acknowledge and keep it in check, rather than live our lives pretending it doesn’t exist. Didn’t expect that in this movie, did you? Time for the pros and cons. A quality that works both in favor of and against the film is that it trudges along slower than most horror films, with everything starting relatively normal and very slowly cranking the volume to 11. There isn’t even a single true jump scare in this film, like most other movies in the genre. 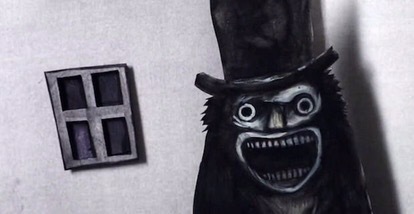 Rather, the film focuses more on the suspense, and the fear in the question of whether the strange occurrences in the house mean that the Babadook really even exists. It’s the kind of build up reminiscent to the first Halloween. Myers is always there, looming and adding tension every time you think he’ll strike but doesn’t. It very subtly just becomes more and more terrifying with every single day, every sleepless night we go through in Amelia’s life. This works out immensely for the film, not having to rely on cheap tricks or some horror cliche to “scare” you. The performances given by Essie Davis and Noah Wiseman are amazing as well. They never really feel too ham fisted or cheesy, always striking a good balance with each other’s characters, Amelia, the mother who thinks her son is misbehaving because his father is gone, and Samuel who wants to save his mother from the monster. A couple of things that came off as negatives were that Samuel seems too annoying and bratty at times, but I believe it’s to try and encapsulate the thoughts of Amelia to the viewer. He screams and cries bloody murder throughout the film, breaking down the patience of both Amelia and the viewer. Another negative is the same reason that works in favor of it- it’s that the film is a lot slower than conventionally found in most films. It’s lack of modern horror movies tropes, such as jumpscares and sudden loud noises, make it seem sort of… well, boring. I understand why some people may not like this in the film. It really might feel like a grind to get to the best parts, espcially through scenes of Sam being loud and obnoxious, and that guy that Amelia works with adds a weird relationship plotline that is mildly interesting. But I assure you all, it’s well worth every nail-biting second to the end.